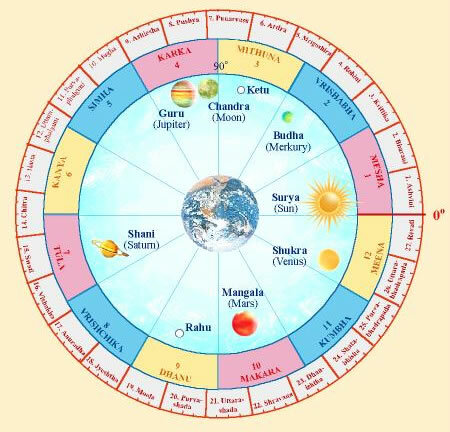 This illustration shows an example of the placement of the 9 Grahas in the 12 Rashis and the 27 Nakshatras at the time of birth for a particular individual. The Grahas move with different speeds in their orbits in the heavens. At the time of birth, each Graha is placed in a particular position within the circles of the Rashis and Nakshatras. Through the interaction of the 9 Grahas with the 12 Rashis and the 27 Nakshatras, manifold influences are created for individual and for collective life. As the Grahas, so the Rashis and the Nakshatras are related to all areas of life—for individuals, for organizations, nations, and for the world as a whole. To request a Maharishi Jyotish Consultation, please see the instructions on the Services tab. For a more complete introduction to the fundamental principles of the Maharishi Jyotish program, please proceed to Gochara—Planetary Transits.